For the geologically-minded, the Hole-in-the-Rock Road in Utah’s vast Grand Staircase-Escalante National Monument provides access to extraordinary cuts and sluices in the Navajo sandstone (e.g., Peekaboo & Spooky slot canyons, Coyote Gulch), dating to the early Jurassic Period. These canyons—tributaries of the mighty Escalante River—are situated principally to the east of the dusty, 62-mile access road. To the west, however, nestled in the foothills of the Straight Cliffs, lies a curious collection of outcrops in the Entrada sandstone, a younger, late Jurassic formation. Echoing the name of a much more famous attraction in Arches National Park, this is called Devil’s Garden. 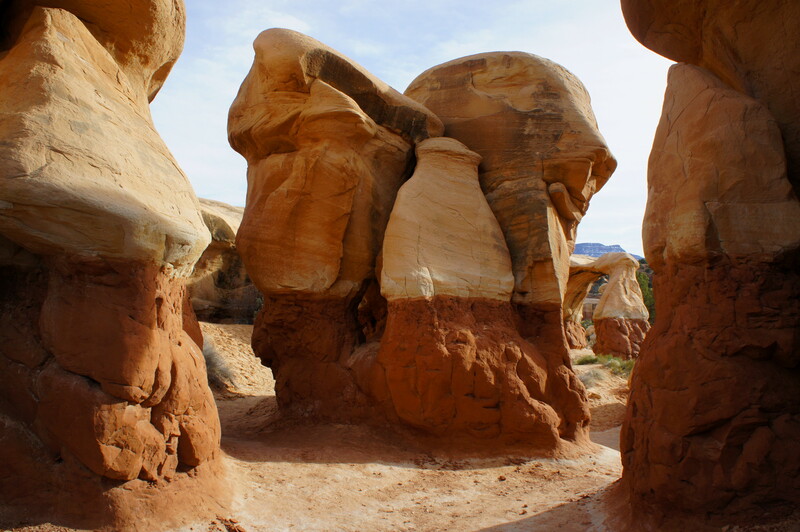 While small, this playground of hoodoos, arches, and spires is worth taking an hour or two to explore. 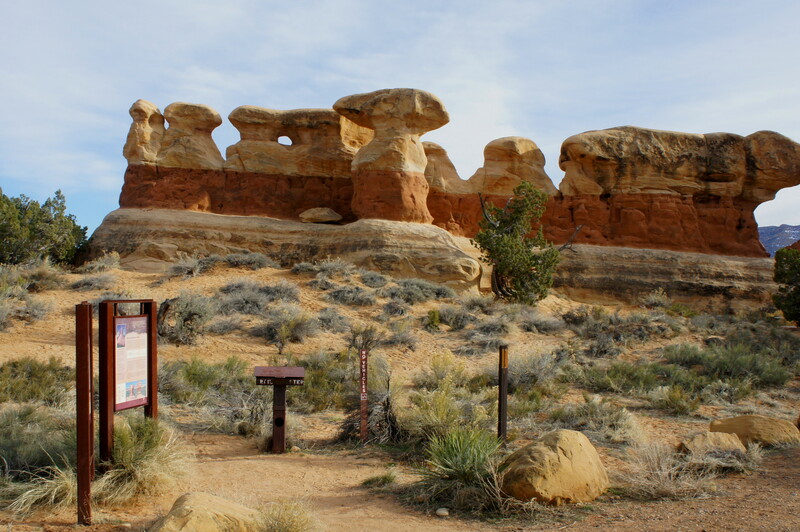 Roughly 12 miles down the Hole-in-the-Rock Road from Utah Highway 12, look for a sign directing visitors to Devil’s Garden Recreation Area on the right. A short spur road leads to the small park-within-a-park, a pleasant place for a picnic or short hike. While there are no officially marked trails, seemingly dozens of intersecting footpaths take off from the parking area. Colorfully striped hoodoos are visible right away from the parking lot. 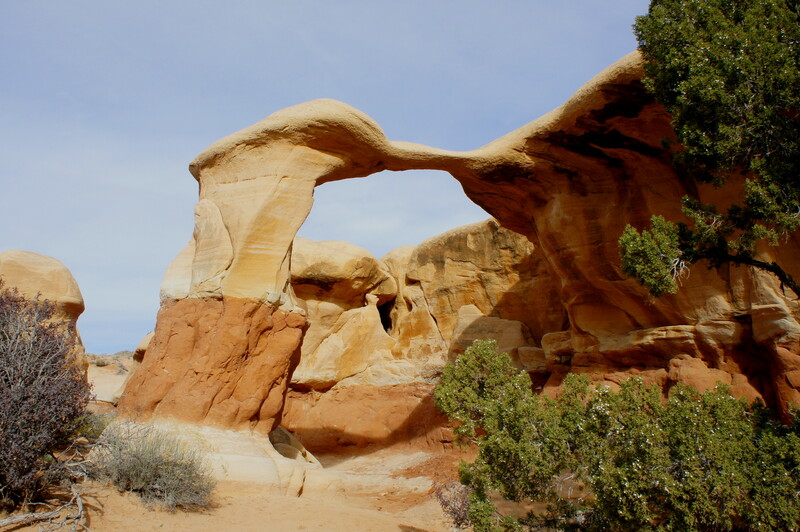 The Entrada sandstone here can be dissected into three parts: a yellow-white Escalante Member, multicolor Cannonville Member, and red/peach-hued Gunsight Butte Member. 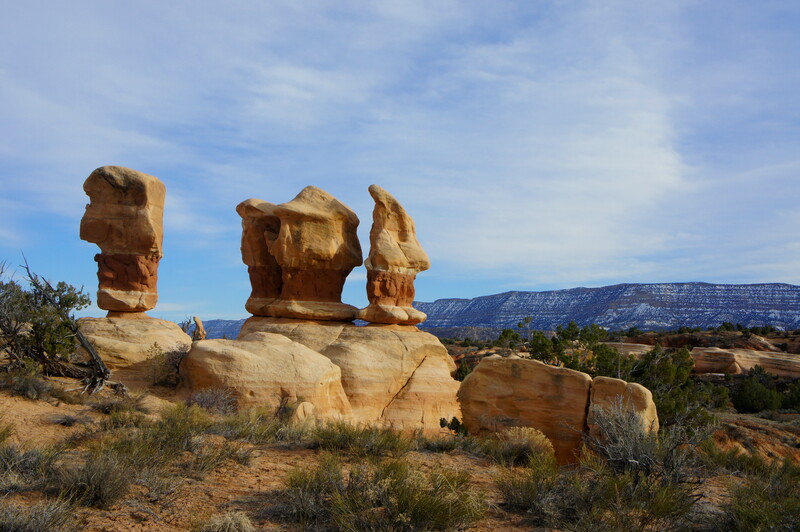 The hoodoos of Devil’s Garden form at the juncture of the last two: the Gunsight Butte erodes at a quicker rate, while the more durable Cannonville forms a protective cap. 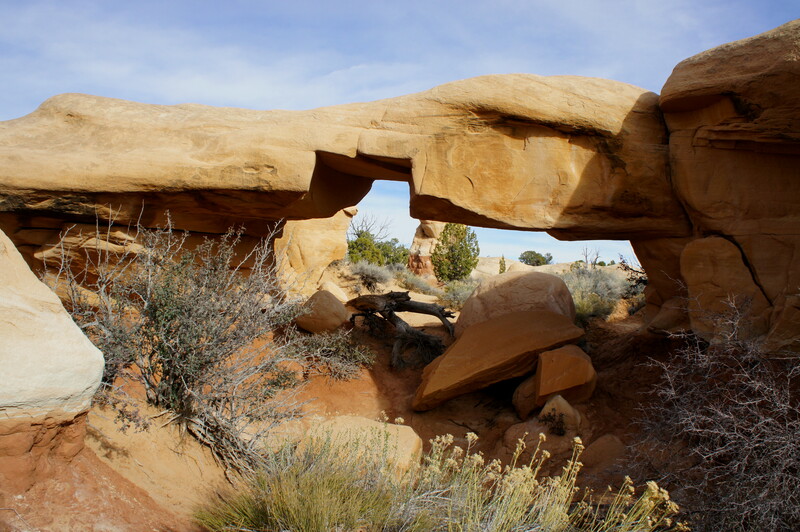 Bearing slightly southwest from the parking lot, it is a short walk to Mano Arch and Metate Arch, named for the stone tools used by MesoAmerican cultures to grind food. Mano Arch is thick and blocky, with a span cut with a peculiar, rectangular-shaped incision. Metate Arch is thin and delicate, a graceful cut in the Entrada overlooking a minor valley to the west. 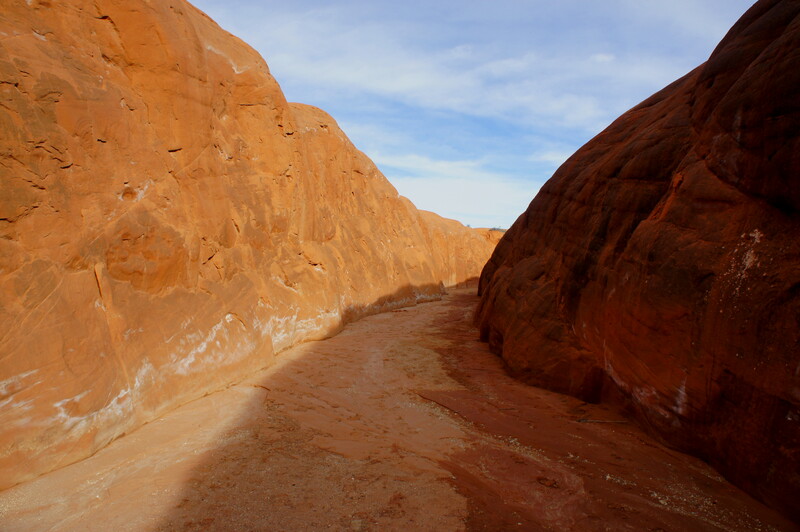 While the arches and hoodoos are the highlights, it is also possible to walk through a short narrows section, where the main wash cuts into the reddish Gunsight Butte member. These narrows, however, are far from impressive—and should be skipped if short on time. After an hour or two of strolling, picnicking, climbing, etc., return to your car, and continue to explore what the historic and scenic Hole-in-the-Rock Road has to offer. This entry was posted in Grand Staircase-Escalante National Monument, Utah and tagged arch, Devil's Garden, Entrada sandstone, Escalante, Grand Staircase-Escalante, Hole-in-the-Rock Road, hoodoos, Mano Arch, Metate Arch, Narrows, spire, Straight Cliffs, Utah. Bookmark the permalink. Sometimes a fun, easy stroll is the way to go. We must get to this area next year, for sure. I really enjoy all the rock knowledge I am gaining from your posts. Thanks for sharing! Okay, this might be a no brainer (don’t yell at me!) but I would guess that climbing/bouldering on the hoodoos and rock formations is frowned upon? I’ll be visiting next week and I know my first inclination looking at those will be to climb all the things. But obviously I don’t want to do anything that would cause damage to these formations. However, I know that people will climb a little ways up in narrow slots. I guess I’m just trying to figure out what is okay and what’s not. P.S. I am loving your articles and they’ve been the main resource for planning my trip through GSE! Another edit, I don’t mean trad climbing or anything, just bouldering and playing around on them. Hey Savannah – I’m not exactly sure of the rules, but I would guess the best answer is: be judicious. When I was there, I did spot some people climbing a slickrock slope to the top of a perch across the wash from the main “garden”–but this is probably different from heading straight up one of the thin hoodoos or say, across Mano or Metate Arch (the latter of which is probably downright impossible). Alternatively, you can always get your fix of climbing at Peekaboo or Spooky Gulch just down the road! I came across your blog and LOVE it! I was wondering if you had an opinion about choosing between Grand Staircase or Valley of Fire (due to time constraints)? Any help appreciated. Thanks so much. Oh yes, we are travelling this April 23-29 Zion to Bryce to Capitol Reef then? Glad you’ve found the site useful. Tough choice! But if the weather has been nice (as in, no recent flooding that makes roads inaccessible) and you are already planning to hit three parks in Utah, I would choose Grand Staircase-Escalante. The place is just magical, especially the Peekaboo/Spooky slot canyons and Lower Calf Creek Falls. Valley of Fire is also nice but more out of the way. Hope that helps! Happy to provide more specifics if you’d like. Settled! Thanks so much I love how detailed your posts are and how amazing your pics are, keep on hiking and keep on blogging.